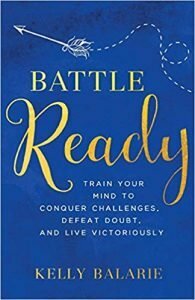 Join the Bible Cafe™ as we study Battle Ready: Train Your Mind to Conquer Challenges, Defeat Doubt, and Live Victoriously by Kelly Balarie. This NEW online Bible study is available on-demand from our membership site (exclusive author videos are included). Too often we fail to prepare for our battles. So when challenges, troubles, or opportunities arise, we rapidly become burdened with limiting thoughts of self-doubt, fear, impossibility, and lack. But it doesn’t have to be this way. We can train our minds to conquer uncertainty, beat insecurity, and step past the tragedies of yesterday. Battle Ready book is available in print or digital format from Amazon, ChristianBooks, Barnes and Noble, and perhaps your local library.